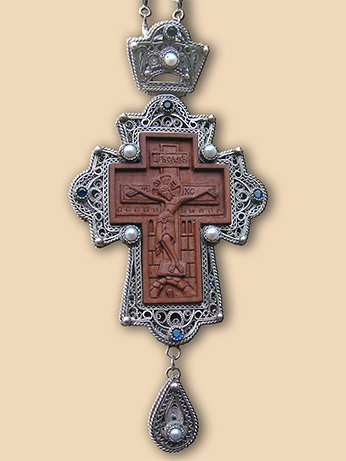 Pectoral cross in silver filigree with hand painted miniature icon on enamel of Jesus Christ with natural pearls and green zircons. Material: silver 950, natural pearls, spinel, wild pear wood. Technique: filigree, granulation, miniature carving on wild pear wood, stone setting. Size: 17 (11) × 9 cm, chain 120 cm. 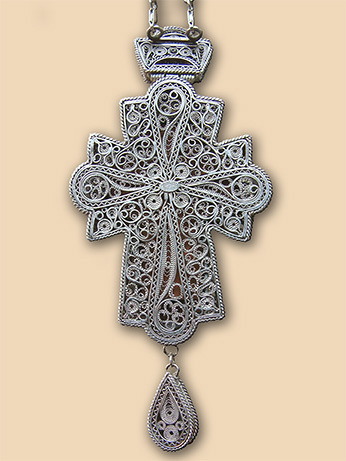 Weight: cross 122 grams, chain 77.50 grams.